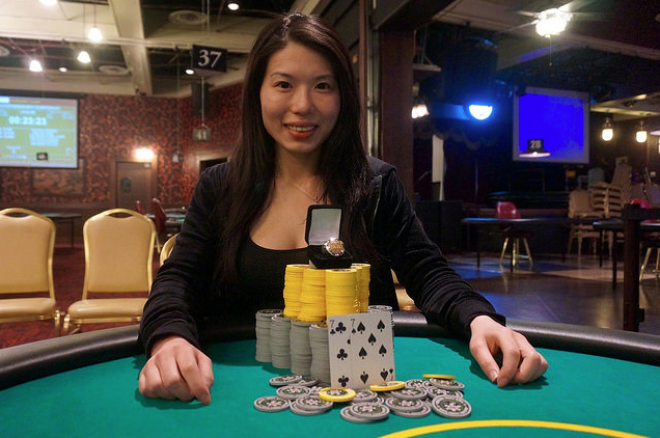 It took 156 tries, but the World Series of Poker Circuit has found its first female main event champion after Michelle Chin won the Horseshoe Council Bluffs $1,675 Main Event to the tune of $88,126. After the event, she was elated, telling WSOP officials, "It feels really great. This is probably at most the 10th tournament I've ever played in my life. It's just awesome to make history." Chin, a resident of Wichita, Kansas, made history when she topped the 235-entry field and took home the lion's share of the $352,500 prize pool. He road to victory included a heads-up battle with Mike Lang and another tough obstacle in the way in the form of Harvey's Lake Tahoe Main Event champion Jesse Wilke. From the field, the top 24 finishers reached the money. Those busting with a cash included Blair Hinkle (20th - $3,803), Alex Masek (17th - $4,508), Eric Rodawig (14th - $5,148), and Chris Karambinis (11th - $6,599). After Day 2 had completed, just four players remaining, with Chin on top by a solid margin of 25 big blinds. She held 1.805 million in chips going into Day 3, with Lang and Wilke nearly tied for second place with 1.06 million and 1.035 million in chips, respectively. Michael Sanders rounded out the final four competitors with 800,000. Wilke was the first to fall on Day 3, hitting the rail when his couldn't win the flip against the for Chin. According to WSOP reports, Wilke did flop the best hand with top pair and an open-ended straight draw, but Chin turned a set and held from there. Sanders was next to go, failing to hold with the against the aggressive maneuver by Chin holding the . Sanders opened preflop before Chin reraised all in. Sanders called, saw he was ahead, but a five on the turn gave Chin the knockout. With the field down to just two, Chin had a nice lead. She headed into the duel with Lang holding 3.25 million in chips to Lang's 1.45 million. She quickly knocked her opponent down under 1 million and then finished him off not too long after. On the final hand, Lang raised on the button before four-betting all in for about 950,000 with the . Chin called with the . Again Chin was ahead with a pair, but her opponent took the lead. This time, Lang turned a ten, but just like when she knocked out Wilke in fourth place, Chin hit a set to move back in front. After the hit on the river, it was all over, and Lang had to finish with a second-place result worth $54,468. Photo and data courtesy of WSOP.com.